If you’re curious, Emperor Geta is the one erased in this case. Damnatio memoriae (condemnation of memory) was a punishment reserved for certain people the Romans decided to dishonour for one reason or another. Rather impressively, it involved trying to get rid of all records that the person ever existed. Understandably, historians aren’t aware of any people to whom this dishonor was successfully applied, since if they did, it wouldn’t have been successful. They are, however, aware of a number of high profile cases in which damnatio memoriae was decreed, but we still know of the individuals today. Before we get ahead of ourselves, we should discuss what the specifics are behind damnatio memoriae itself and what one would need to do to earn such a punishment. Damnatio memoriae was normally reserved for those such as Senators and Emperors whose acts did not reflect well on Rome, or those who committed treason or a number of other serious crimes. Brutal or tyrannical emperors were particularly susceptible to earning a date with the giant eraser of history. The methods used to rid the world of any record of the individual in question included striking the individual’s name from all official records; seizing their possessions; and anything bearing their likeness or name (statues, murals, writings, etc.) would be destroyed or otherwise defaced. To really rub it in, if the person being stricken from memory just so happened to be dead at the time, which was common, their will would be annulled and their grave defaced. That said, fully removing some of these high profile people, such as Emperors, from history proved to be exceptionally difficult, and despite the Roman’s best efforts, at least some of the people who suffered damnatio memoriae as a punishment are still in the history books. For example, consider Roman Emperor Maxentius who, despite being a victim of damnatio memoriae in 312AD at the hands of Emperor Constantine, we still know a lot about. Maxentius’ father, Maximian, was also subjected to damnatio memoriae in 310AD by Emperor Constantine. However, Constantine changed his mind and Maximian was instead deified, essentially making him a God in the eyes of the Roman people… which we’re sure he would have enjoyed more if Constantine hadn’t forced him to commit suicide in 310AD. A Roman Emperor that was, rather surprisingly, saved from this fate was the famously mad Emperor Caligula. When Caligula was assassinated in 41 AD, his successor, Claudius immediately shot down the Senate’s attempts at removing his nephew’s memory from history. This is a particularly notable case in that it is known that the decision to try to remove Caligula from history was heavily influenced by public opinion, suggesting that popular opinion played a part in deciding who to punish via damnatio memoriae. Perhaps one of the more dark instances of damnatio memoriae is the story of Publius Septimius Geta who was murdered in his mother’s arms on his older brother, Caracalla’s, orders. After the murder of his brother, Caracalla declared damnatio memoriae on his brother’s name and had about 20,000 people he didn’t like executed while he was at it. 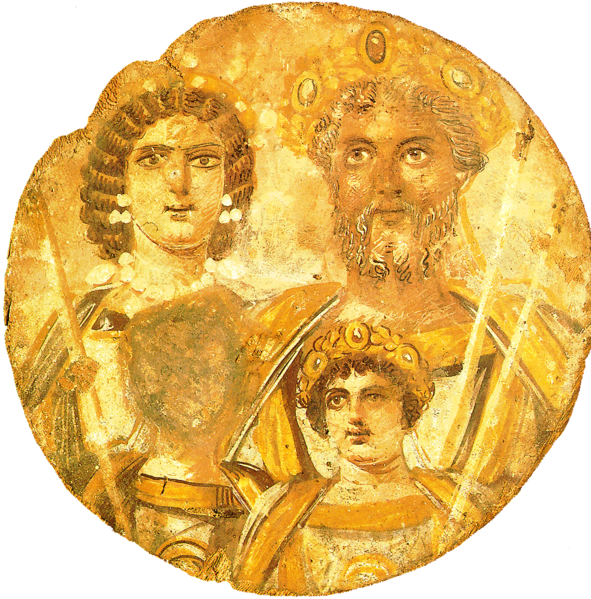 By all accounts, Caracalla’s order was incredibly thorough and few images of Geta survived. However, there was one thing Caracalla couldn’t get rid of completely- the millions of coins sporting his brother’s face circulating freely throughout his empire. Also, due to Geta’s popularity with the people of Rome, Caracalla was forced to give his brother a lavish funeral. Damnatio memoriae is still practiced on occasion by various people and groups in one form or another. 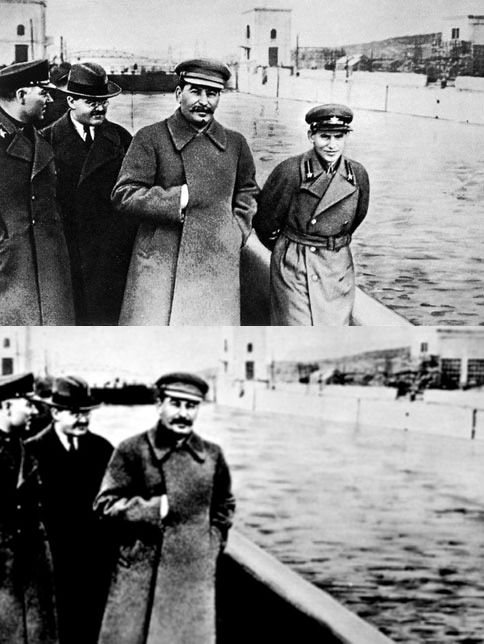 For instance Stalin was famous for erasing people he didn’t like from photos and official documents, such as the picture on the right. The disappearing man is Nikolai Yezkov, one time very powerful head of the NKVD (People’s Commissariat for Internal Affairs). In his post there, he presided over numerous tortures and mass-executions during the Great Purge, but later fell out of favor and himself was tortured until he admitted to being a traitor; after this, he himself was purged. Once this happened, he became “The Vanishing Commisar” with records of him, including in photographs, suddenly disappearing, which was no small feat given the high profile position Yezkov had previously held.